View to the south from Miller Mountain region with smoke from Camp Pendleton. I examined the location with Google Earth, trying to find the best route into the area. Tom Chester graciously provided me with information on access and maps of trails in the area, and Kirsten Winter of the Cleveland National Forest also assisted in providing information access. The consensus was to proceed out a Forest Service road and then walk up a trail along one of the canyon bottoms that heads up to the mountain. I examined the area closely and noted that the canyon bottom was full of oak trees and I surmised that it was probably also full of poison oak in at least the portion beneath the canopy of the oaks. I thought I could see a trace of a trail for the portion that was outside of the trees. Actually, several traces of trails were visible; however, it appeared that people I spoke to about going with me were apprehensive because of the poison oak. I have walked through a large amount of poison oak in my life, surprisingly without being affected. My mother once had a bad case from washing my brothers’ and my clothing after we had walked through it. Jonathan Dunn decided he would go along in spite of the fact that he can have severe cases of poison oak if he has been exposed to it. Picking a date to try it was another challenge. There were reports that we were picking a date too early since other sites of Brodiaea filifolia were not yet in flower. However, I based the decision on the collections that had been made between the first week of May and the first week of July with most from mid-May to mid-June. Considering that so many other plants were early this particular year and that we had low rainfall and warmer dry weather I felt confident about the mid-June date we chose. Working toward the take off point, I relived once again the folly of relying solely on Google Earth to find a site. We did have to drive to Riverside County west of Temecula to find the site. Eventually we drove into the general area through a beautiful valley that was gradually being developed with large houses. We drove past one site that had a Polo Field and traveled on to Tenaja Road and then Cold Springs Road. The trail head we planned to walk came out of a sharp turn in the road. We examined nearby to be sure we had the correct location. The worse part was the trail seemed to be non-existent. A narrow erosion channel existed in the bottom of the Canyon. It went beneath the trees where branches hang low. Last December, a highly unusual snowfall fell in the east in the Temecula region and though it was not much more than a foot in depth, a high number of the trees exhibited broken branch tops. The problem was that a large amount of downed wood lay in the drainage bottom and branches of Malosma laurina and oaks crossed the path making it more difficult to pass through. Poison oak, though it was more slender and spindly beneath the trees, was growing along the sides of the drainage channel and drooping over the channel. I don’t know what seemed to be visible on Google Earth, but there did not seem to be a real trail. The temperature that day was predicted to be in the mid 90’s Gnats and flies were another annoyance with the heat and perspiration especially near dry pools of water filled with leaves and decaying vegetable matter. Further up, I had to crawl on my knees in several places to pass beneath the low branches and then just before the oak portion ended, the poison oak was denser again with wand-like branches blocking the path. They provided lush greenery to the area just tinged with yellow from the dryness. At the end, we emerged into a dense chaparral patch but above that, Coastal sage scrub and grassy patches existed. We exited the chaparral and entered the next level. Leptosiphon liniflorus grew along an edge area between the Artemisia and the chaparral. The pale lavender flowers have little striations radially on the petals. The trail I thought I had seen from google earth images was not visible and maybe not present on the slope any longer. The first slope up hills was steep and in order to avoid the majority of the shrubs, we drifted to the west a little ways. The view to the south was beautiful heavy chaparral, two isolated homesteads existed. One was definitely placed in the midst of the chaparral. This chaparral appeared to all be old growth which is surprising because as we climbed, we detected smoke coming from Camp Pendleton to the west. It is well known that fires are frequent on Camp Pendleton due in part to the types of training activities held there. One would think that the prevailing winds would carry fire from the base to the lands to the east, however, it is apparent that firefighting activities have prevented fires from burning off of the Base since the vegetation is so large and old in this area. Throughout the day, the smoke drifted over us and created a haze over the valley. The slope was steep as we kept climbing but then we passed over onto a grassy shoulder and on up into chaparral with Engelmann Oaks nearby. Over the knoll, a grassy valley opened before us. We were attempting to stay on a course of what we thought was public lands. We waked on through it and toward a hill slope when a heard of cows became aware of our presence and started moving toward us. As they moved, it was clearly apparent that the level of flies intensified. We were already very hot and sweaty, and now flies. We found a way out of that pasture and then did a reconnaissance for our location and the peak. The peak situation is interesting. The actual highest peak is a steep knoll that is 2,953 feet but it is also separated by a saddle by .4 miles from another mountain that is a flat mesa on top. That mountain is 2,946 feet high at the west end. 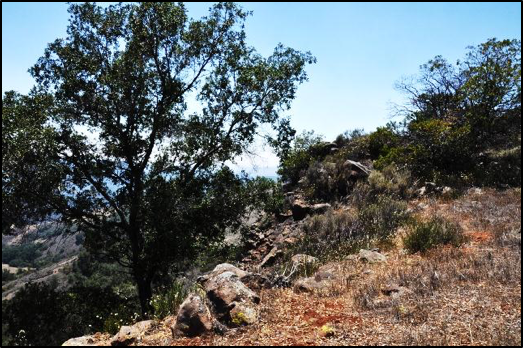 We walked up onto the saddle along a ridge between the two peaks and climbed through big volcanic rocks and then stopped in the shade of a large coast live oak tree. The mesa is about 2,300 feet in elevation and four tenths of a mile long and 300 feet wide, but it is not perfectly flat since it drops about 75 feet in elevation from the west to the east. All along as we walked, we were looking for Brodiaea. However, we examined soils with clay and soils with Deinandra that appeared to be perfect for Brodiaea. However, we saw none. We ate lunch in the shade of the tree, sitting on dried cup shaped oak leaves typical of Coast Live Oaks and we drank a lot of our water and Gatorade to prevent me from getting leg cramps. The temperature was very warm. After we ate, we began walking down the gently sloping mesa portion of the mountain top. About a third of the way down as we walked separately, Jonathan and I found one at exactly the same time. After that, we found more of them. Nearly all of them were on their last flower with no more buds. It was very apparent that if we waited another wee, there would not have bene flowers any longer and we would not have seen them at all. Farther down to the east on the mesa, we observe a few small clusters of 2 or 3 at a time. There weren’t very many. They grow in the rock locations. The mesa had Engelmann oaks, coast live oaks, and the grassy areas had Avena (wild oats) and Nassella (native bunch grass), mostly. It looked like just dry grassland. This part of the County does not seem to have received as much rainfall as parts of the southern part of the County that season. One thing, however, is that when you encounter one of these blue mini-flowered lily-like plants in the mist of dry straw, they are striking. The blue flowers appear to float over the grass as little gems. This type of discovery is the epitome of finding rare plants. It’s a beautiful little flower and the fact that it is in a remote location makes it more interesting. It was also a relief that we saw them because I had beginnings of doubt that they even appeared that year, but fortunately, I was wrong. Time was passing by. The afternoon was hot. Up on the east end, there seemed to be little opportunity for a climb down because the rocky volcanic cap left a drop that was nearly vertical. We found a slight gap in the rocky top so we headed down. The pathway was precarious, stepping down so that we did not trip and fall. A fall would have been a long distance catastrophe. I nearly stepped on a Mourning dove nest on the ground. The bird flushed. It had one egg and one chick. The slope was all Coastal sage scrub with Artemisia californica (coastal sagebrush) and a little Eriogonum fasciculatum (flat-top buckwheat). Malosma laurina (laurel sumac) was the dominant shrub at the base and they were quite large and their branches interlocked preventing a simple passage through them. We found some Brodiaeas in one place where there were a few growing in low semi moist spot. After we cleared the area of the shrubs, we passed onto a grassy slope. Jonathan stopped to drink some water under a sycamore in an area where cattle congregated. There we unexpectedly found some more Brodiaea growing. We were now in a little valley. We next determined our route to be out of the pasture and down the initial slope that we came up. The smoke odor was stronger and the haze from the smoke began to be more apparent in the valley below us. It was still uncomfortably hot and I had been drinking a lot of water. I had another bottle of Gatorade back at the car that I was looking forward to drinking. As much as I don’t relish Gatorade, I drink it to help prevent leg cramps. From the slope we could see tracings of a trail through the chaparral that were not apparent when we walked up. We headed for that so that the chaparral was more passable for the first few dozen yards, but then the trail took us right back into the oak canopy. Jonathan was concerned about poison oak and opted to go outside of it. I went forward through the greenish pastel light provided by the semi-translucent poison oak leaves. It was pretty but there certainly was a high level of poison oak there. I moved it out of the way with my gloved hands trying to be careful not to touch my bare skin with my gloves later, but I knew that I did touch it. On the way out, I again had to crawl under downed branches and retraced my steps. Perspiration, flies and gnats (fortunately not the biting kinds) and a lot of poison oak were all present. We arrived at the car at nearly the same time then drove back out of that area and headed down I-15. Jonathan’s Fitbit indicated that we had walked over ten miles. What an interesting location! Chester, T., W. Armstrong and K. Madore. 2007. 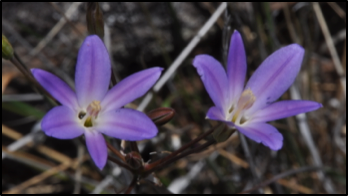 Brodiaea santarosae (Thenidaceae), a new rare species from the Santa Rosa Basalt area of the Santa Ana Mountains of Southern California. Madrono 54:187-198. Kennedy, M. P. 1977. Recency and character of faults along the Elsinore Fault Zone in Southern California. U.S. Geological Survey, Department of Interior, Special Report 131. California Division of Mines and Geology. Newer PostWhy would anyone in their right mind keep a collection of dead plants? A visit to the herbarium at UC Davis.